In April, when I was still in Georgia, a friend asked me if I could do something to her daughter's walls. She gathered a few of her favorite ideas, which happened to all be from the Pottery Barn Kids catalog. Normally I try to do my own thing/idea but she really liked the one above, and I figured why not just do it for her? I don't always have to be original and it was pretty and really perfect for the room. Just thought I would share my version and how I did it! 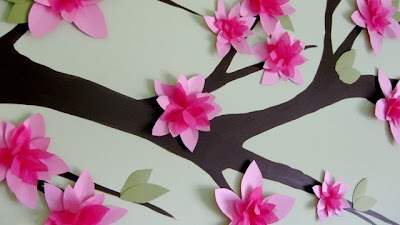 5. hot glue the tissue paper flowers to the cardstock flowers. 6. cut out a bunch of leaves and hot glue them in pairs. 7. cut the 3m tabs into much smaller squares and adhere them to the flowers and leaves. 8. attach them to the wall! done! Pretty. I like how it is 3d. 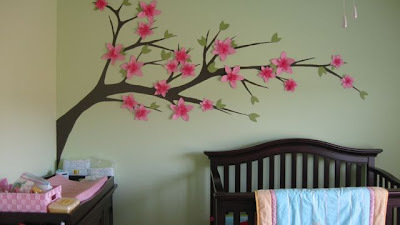 I might have to modify Alina's 2d tree in her room! that looks amazing katie! 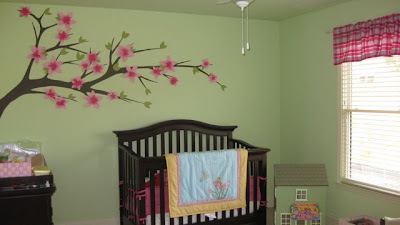 the colors look so vibrant and pretty in that little nursery. you're amazing!